Figure 1: Omega Centauri, one of the better known globular clusters. Credit: European Space Agency (ESO), released under creative commons. The Milky Way does not travel alone through the void. It has a gaggle of followers. Most obvious from the Earth are some of the dwarf galaxies, such as the Magellanic Clouds, which orbit the Milky Way. Smaller but much more numerous are the globular clusters, of which the Milky Way has around 150. A globular cluster is a very tight group of old, red stars, and generally orbits the Milky Way within its halo (they are also found around other galaxies, but for today we are focussing on satellites of our own galaxy). A famous example is Omega Centauri (Figure 1). With every generation of telescopes, we can see fainter stars and resolve their positions more precisely. We can detect and explore more of these satellites now than at any time in the past. Understanding dwarf galaxies is important for understanding not just their evolution but that of our own galaxy, as there is clearly a large amount of interaction between the Milky Way and its smaller neighbours. 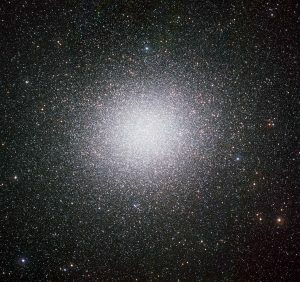 It seems that globular clusters are part of the puzzle as well: we know that globular clusters can be stolen from one galaxy by its neighbour as they pass close to each other, and there is a suggestion that globular clusters may be formed from the hearts of dwarf galaxies that have had many of their stars stripped away. Previous astrobiters have written about Gaia, the space telescope that will measure the position and velocity of over a billion stars. At the moment, only the first set of Gaia data has been released: it contains the brightness and positions of most of the targets, but not yet their distances, colours or velocities. The team behind today’s paper have been using just these stellar position measurements to hunt for new galactic satellites. Towards this end, they search for small patches of the sky that have an unusually high number of stars when compared to nearby regions. Figure 2 shows the density they find. The bright yellow spots are regions of unusually high density such as clusters or dwarf galaxies. The team were surprised at how effective their algorithm was: it highlighted several incredibly faint dwarf galaxies that were only discovered in the past two years. It also found two new objects, now named Gaia 1 and Gaia 2, which they analyse in today’s paper. Figure 2: The density of stars on the sky when compared with surround regions. Bright yellow points are small, dense groups of stars such as clusters and dwarf galaxies. You can also see the disc of the Milky Way (across the centre of the image) and the 2 Magellanic Clouds (towards the lower right). 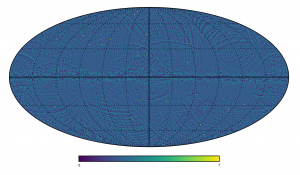 The sweeping web of blue-green lines throughout the image follow the paths Gaia has observed along. They represent areas that have been observed more frequently and hence where fainter stars have been detected. This is Figure 1 in today’s paper. Figure 3: Detection of Gaia 1. Top row: The density of stars according to Gaia (first two images) and a previous survey, 2MASS (third image). In all images Gaia 1 is clear as a denser region. Bottom row: infrared image of Gaia 1 and the surrounding sky. In the first panel the bright star on the right is Sirius. In the second panel Sirius has been subtracted, though a lot of scattered light remains in the image. 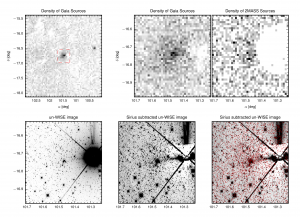 The third panel is the same image with all Gaia-detected stars over-plotted as red points. This is Figure 3 in today’s paper. The larger of the two clusters was hiding close to Sirius, the brightest star in the night sky. Images taken close to stars this bright are often hard to use: the reflection and refraction of its light creates blurs and smudges on the surrounding image, as you can see in Figure 3. Because Gaia takes numerous images of each region of sky, these effects average out in their data allowing the nearby cluster to be identified for the first time. The cluster appears to be dominated by old stars, with a particularly prominent number of red giants, as would be expected from a globular cluster. An estimate of the cluster’s age from its Hertzprung-Russell diagram puts it at 4.6 billion years. To put that in perspective, it’s comparable to the sun’s age, and fairly typical for a globular cluster — as opposed to the other main class, open clusters, which are less tightly bound by gravity and tend to drift apart on a timescale in the millions of years. The team measured a distance to the cluster of 4600 parsecs (well within the halo of the Milky Way) and a size of 9 parsecs (also typical of globular clusters; for comparison, a parsec is roughly the distance between us and our closest star, Proxima Centauri). They estimate the total mass of the cluster as 14,000 times the mass of our sun — so clearly these stars are densely packed! The second cluster, Gaia 2, is smaller than Gaia 1 at 3 parsecs across, and even older at around 10 billion years. It has a distance of 5500 parsecs. Given this size, age, and appearance, they believe that this is another globular cluster. With better images, it will be possible to find out more about these clusters and confirm some of their less certain details. Beyond this, the discovery of these two new objects highlights the revolutionary potential Gaia has in this field. With the release of future sets of Gaia data, which will include colours, distances, and movements for each star it targets, it is clear that many more galactic satellites will be revealed. The next data release is scheduled for early next year, so until then, watch this space!